How does the Smart Hob system save time on site? The Smart Hob system saves time by removing the need to conventionally box up hobs with plywood and then returning to strip once the concrete has set. Is the Smart Hob system easy to use? The Smart Hob system is very easy to use and is quick and reliable in getting a straight and true hob. Download our Smart Hob installation guide here for further information. What length are the hobs manufactured? The hobs are manufactured to standard 3.6m lengths. Custom sizes are made at 3m lengths. What size are the Smart Hobs? The Smart Hob can be manufactured to custom sizes to suit your requirements. We have a range of sizes with standard pricing available for faster turnaround. The smallest height we can manufacture the hob to is 60mm. Can the Smart Hob system be used on the edge of the slab? The Smart Hob system can be used on the edge of slabs, however the hob has to be waterproofed on all sides exposed to the weather. Are the Smart Hobs a finished product once installed? No, the Smart Hob system needs to be tanked with a waterproofing membrane which results in a concrete look finish. The Smart Hob framing system becomes waterproof once standard waterproofing agents or membranes have been applied. How do I waterproof the hob? Once the hob is installed and filled with concrete, tank over the top and two sides of the hob with a waterproofing membrane to seal it from the elements. What waterproofing membrane do you recommend? We don’t specify any particular waterproofing membrane, however it is important you speak to the membrane manufacturer to ensure their system will adhere to the galvanised steel of our hob. How do we finish off the hob once it has been waterproofed? Once the hob is waterproofed it is then ready for the substrate that is being used i.e tiles, to be installed over the waterproofing. What centres are the tags at to fix the hob down to the concrete? The hobs tags are offset at 600mm centres along the hobs for easy fixing to the concrete. What is the lead time on the hobs? Lead time on the standard size hobs is 5-7 days. Custom hobs have a lead time of 7-10 working days. These lead times are ex-works. Can we purchase the hobs locally in another major city? All Smart Hobs are manufactured in Melbourne and distributed nation wide to any location. What is the pricing for Smart Hobs? We have standard pricing available for faster turnaround – contact us on 03 9761 7095 to discuss pricing for your needs. Can the Smart Hob be poured in-situ? 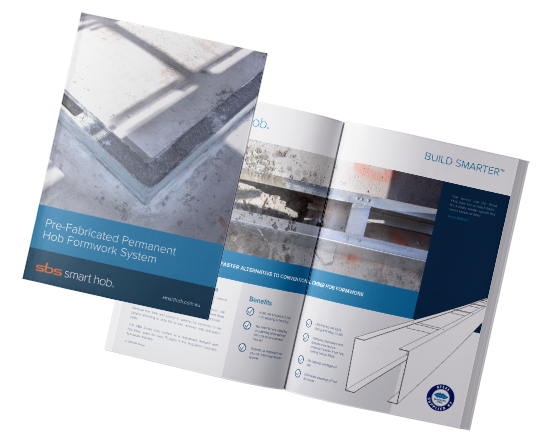 The SBS Smart Hob system is designed for installation once the concrete has been cured and set. Where can I see a sample of the Smart Hob? Fill out the form here – we can either send you a sample Smart Hob in the mail or we will come out and show you how it works. What does a hob do? The Smart Hob system is a fast and efficient way to create a water barrier between living and outdoor areas. The Smart Hob is used mainly in multi storey apartment complexes to separate the apartment and the balconies. Where has the Smart Hob system been used? The Smart Hob is used on a large majority of all Melbourne apartment blocks. This includes Tower Docklands, 883 Collins St Docklands, Oslo Apartments Bentleigh, Regent Residences Richmond and many, many more. What is the benefit of using a pre-fabricated hob over timber formed hob? The Smart Hob creates an accurate and consistent hob profile that is easy for filling. The pre-fabricated hob eliminates the warping and twisting of a timber formed hob. The Smart Hob also eliminates the need for coming back and stripping the timber away from the hob once the concrete is cured, saving considerable amounts of time. Check out our infographic here on how much time you can save by using our pre-fabricated system. Do I need to use reo in the hob? Yes, you will need to insert starter bars vertically or horizontally into the hob, as per the structural engineers recommendations. Still looking for an answer to your question? Contact us on 1300 782 950 or email sales@smarthob.com.au.